Rabbi Eli Silberstein (first name pronounced to rhyme with “deli”) has been the charismatic leader of the Roitman Chabad Center at Cornell University in Ithaca, New York for over twenty-five years. 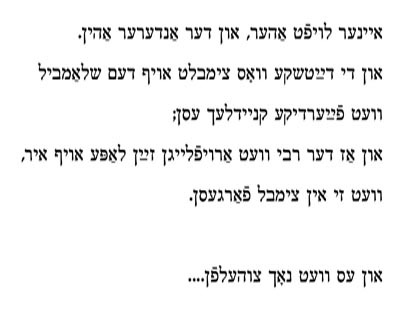 Silberstein comes from a long line of Hasidic scholars from Russia and can also trace his lineage to the Vilna Gaon, one of the foremost rabbis and scholars of the 18th century. He possesses a large repertoire of nigunim that he had learned as a child in Antwerp, Belgium, where he grew up in a community comprising Hasidim from a number of different dynasties, as a Yeshiva student in Israel and France, and in Crown Heights in Brooklyn, New York, the headquarters of the Lubavitcher Hasidim. A noted Talmudic scholar, Silberstein is renowned for his vast knowledge of Jewish law, philosophy and kabbalah. He lectures and publishes extensively, and has developed many courses for the Rohr Jewish Learning Institute. 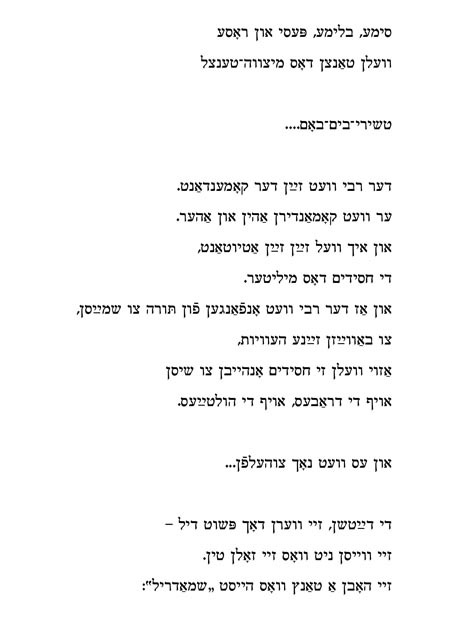 Silberstein is also a ba’al menagen, a masterful singer and an acknowledged expert on Hasidic nigunim and storytelling. Vos vet zayn? (What Will Happen?) 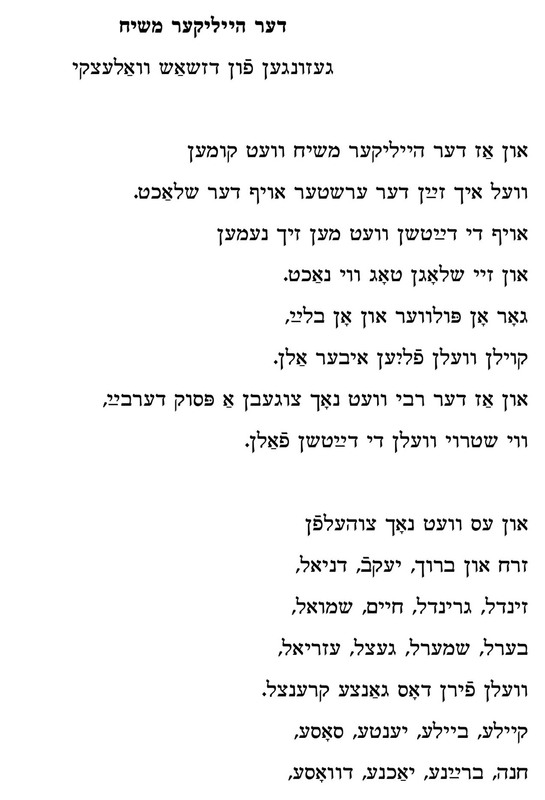 is a cumulative folk song that Silberstein learned from an old recording of Yossele Rosenblatt (1882-1933). Silberstein grew up with the old recordings of the great cantors, especially those of Rosenblatt and Zavel Kwartin (1874-1952). Rabbi Eli Silberstein is the featured vocalist on the new Joel Rubin Ensemble CD, The Nign of Reb Mendl: Hasidic Songs in Yiddish (Traditional Crossroads, 2010). For more information about the CD, click here. veln mir makhn a sudenyu. we’ll make a big feast. Vos veln mir esn oyf dem sudenyu? What will we eat at the feast? Vos veln mir trinken oyf dem sudenyu? What will we drink at the feast? Un ver vet uns toyre zogn oyf dem sudenyu? 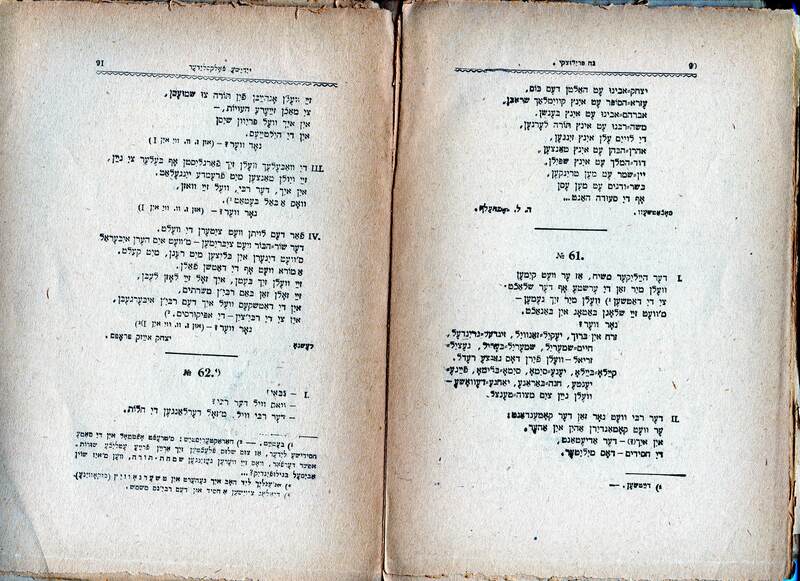 Who will teach us Torah at the feast? Un ver vet uns shpiln oyf dem sudenyu? Who will play for us at the feast? Un ver vet uns khokhme zogn oyf dem sudenyu? Who will tell us things of wisdom at the feast? Un ver vet tantsn oyf dem sudeynu? Who will dance for us at the feast?